Yogurt gives this simple chicken recipe an excellent flavor. If you like lemon, try it with lemon yogurt, it's delicious! Preheat oven to 350°F. Season yogurt liberally with salt and pepper. Place chicken breasts in the yogurt, coat well then remove. 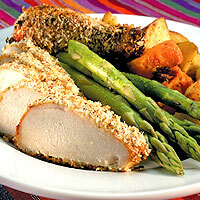 Wipe excess yogurt from the breasts and coat with bread crumbs. Place coated chicken breasts in an oven safe baking dish, and bake for 30 minutes, juices from the chicken should run clear and crust should be golden brown.